We may have had a blessing in disguise happen to us. I'm not going to go into too much detail about it right now, but we may have been given the opportunity to have the hardwood floors in our house refinished. If you remember our house tour, the first floor hardwoods are your typical light stained oak, which was the standard for homes built in the 1950s. The hardwoods in our house are original, and they are in great shape, because it seems as though they were carpeted over at some point. 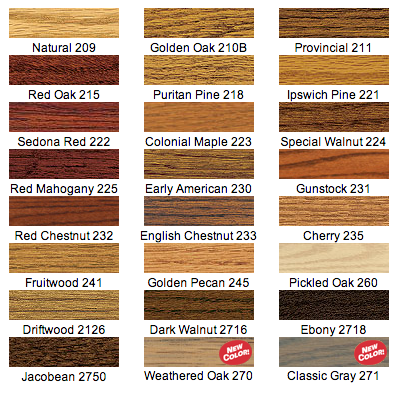 Having grown up with rooms that had the traditional light stained oak, I am more than fine with the color that they currently are, however, with the opportunity to refinish the floors, I'm actually considering changing up the stain color. As a reminder, here is the current color of the floors in the house. When comparing the floor color to Minwax, which is one of the two stain brands that I am using to choose color, this floor is a close match to Ipswitch Pine. I'd like to make the floors darker, and while I know that will show the dust and the cat hair more, I am hoping that it will actually help in motivating me to keep the house clean. Also, the elegance that dark floors bring to a space far exceeds the extra amount of work that may come with having darker wood floors. Agreed? I've been going between the Dark Walnut stain and the Jacobean stain. I think that the two colors will look very different depending on the room, as the room pictured above gets a lot of natural light, whereas the bedrooms in the back of the house don't get a lot of natural light at all. So, I have to be very careful that the color stain that I choose will work in both places. I came across a blog post by Ashley and Greg from 7th House on the Left where they were refinishing their floors and debating between these two colors plus one more as well. Reading about their experience has been very helpful, and we are planning on getting a sample laid on the floors before we choose the color too, so hopefully that will help us decide. What do you think about the two colors? I know that they are very similar, especially when you compare the digital swatches, but the actual paper-copy swatches make the two colors look kinda different, with the Dark Walnut appearing slightly redder than the Jacobean. 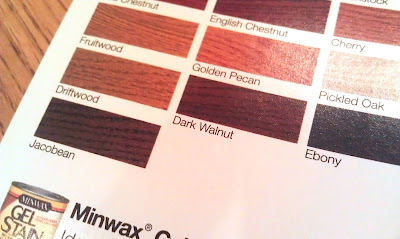 Do any of you have experience with the Dark Walnut or Jacobean stains? What's your favorite non-red tinted floor stain color? Have you used Minwax on your floors? What other brands did you use for floors? Can you tell I have a million questions?! My husband just built a desk and stained it Dark Walnut, it's a really nice color! It is quite dark, and it definitely doesn't have any reddish tone to it at all -- it's much closer to the digital swatch. He used mahogany and pine though, so I'm not sure if it would be very different on oak or not. I'm partial to the red tones, myself, but you should look at what colors you'll have on the walls, furniture and artwork. Is it possible to get two squares of wood, each stained with one of your two choices, and live with them for a few days? Based on what I've seen of your paint choices, the Jacobean might be the better choice. But it's hard to tell. I love natural -- hard woods always get darker with time. I like satin finishes best. Good luck!